The garden is definitely between seasons now, most of the spring veggies have produced their final harvest and have been removed from the garden. On the other hand, a lot of the summer veggies haven't been planted out yet or are just barely getting started. 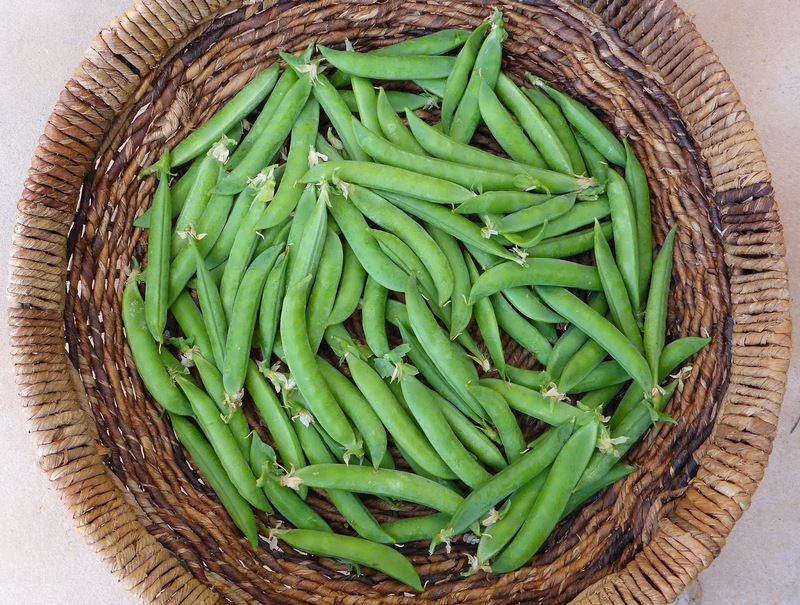 The shelling peas gave up their final basketful of pods last Monday and now there are some Blue Speckled Tepary beans just starting to pop up in their place. 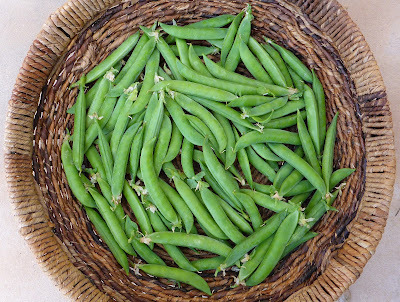 We really enjoyed the peas and my little patch that started with 36 plants (with a few losses along the way) produced 9 pounds (4 kg.) of pods. 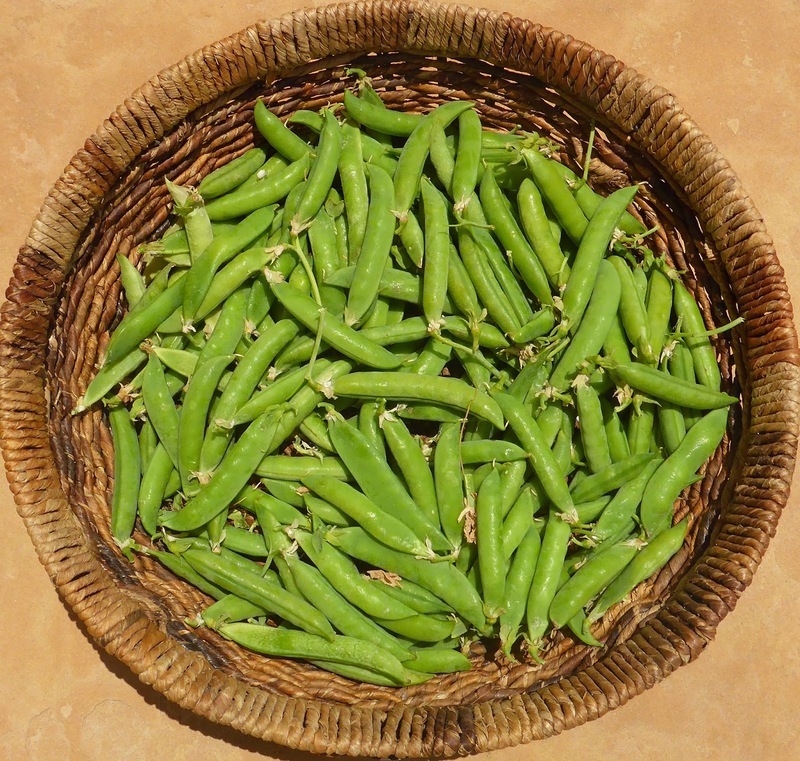 I don't know if other gardeners would be disappointed with an average of only 4 ounces per plant but I'm happy because I harvested enough to satisfy my appetite for peas and not so much that it was a chore to process or preserve them. Also, the short variety that I grew fit in well with the rotation that I use, utilizing a space that might have been been empty for much of the spring growing season. So spring peas will probably be back in the lineup next year. The first bush snap beans were ready to harvest last week. These occupied space right next to the shelling peas. The last couple of years I have been waiting for the soil and weather to warm up to plant bush beans as early as possible and that's what would have gone into the space where the peas grew. In general I prefer to grow pole snap beans rather than bush types because they have a longer harvest period and can produce a second crop, but I can't get the trellises for them into the garden until early June so I start with the bush beans. 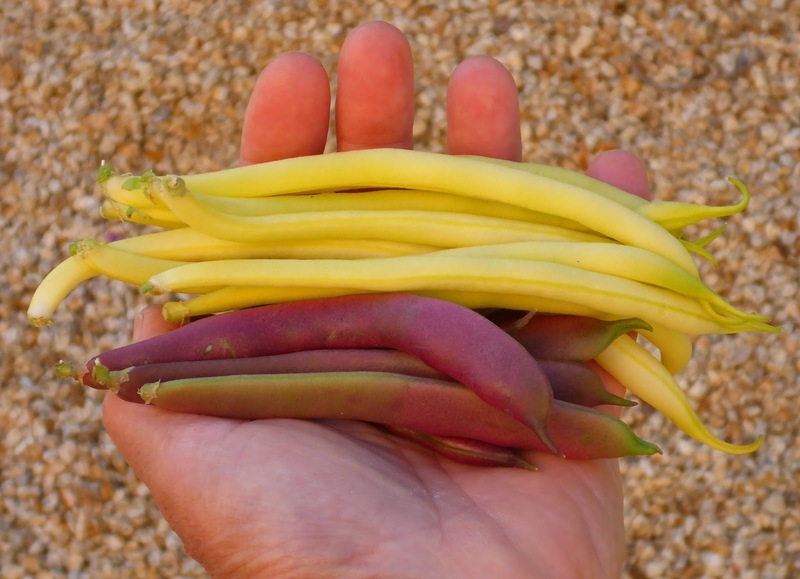 The bush beans finish producing about the time the pole beans start so that's become my usual succession for snap beans. The Tepary beans that I planted are supposed to mature quickly (about 80 days) so they are a good candidate for summer sown dry beans, but this is the first time growing them so I'll see how well they actually fit into the garden. 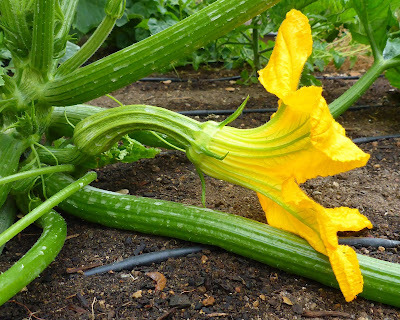 Romanesco zucchini is a proven winner in my garden, it gets off to a quick start and one plant produces more than enough zukes to meet my needs. Some of the onions are bolting and I've been culling them as I find them. There's the latest batch of bolters shown above. 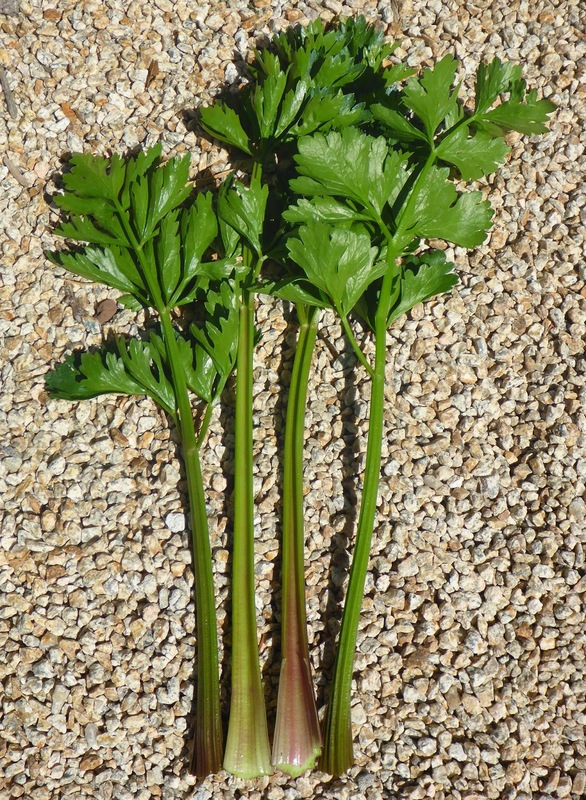 The celery keeps pumping out the stalks and they are getting to be longer and more plump as the season progresses. I'm keeping my fingers crossed that they hold off from bolting, I've really been enjoying their crisp juicy addition to salads and have been cooking with them quite a bit also. 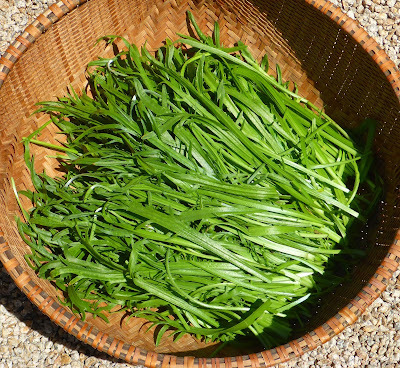 The stalks are a bit too stringy to just munch on, but the strings aren't so fibrous to be unpleasant when the stalks are sliced. That was just one of a number of harvests last week. 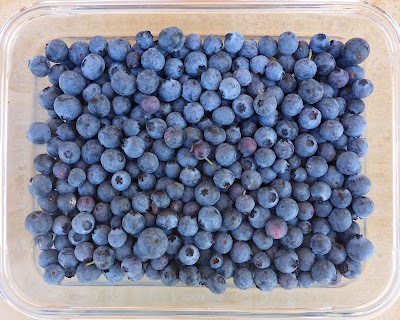 My four potted blueberry bushes have been producing some really good berries and far more than I expected, that harvest was more than a quart (1 liter) of berries. 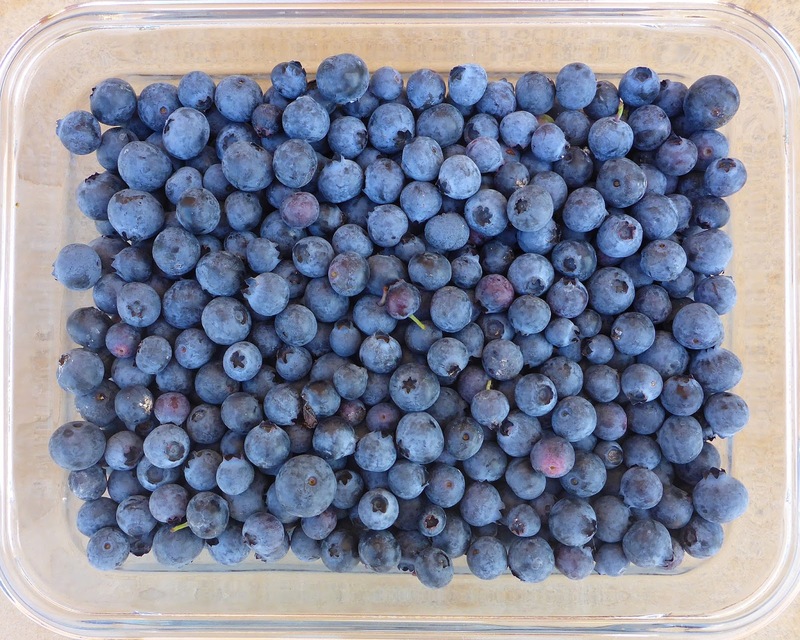 I been able to harvest about a quart of berries once a week for the past three weeks and there's probably about a quart left on the bushes. You aren't going to find these in my tally, I quite trying to tally fruit harvests years ago. 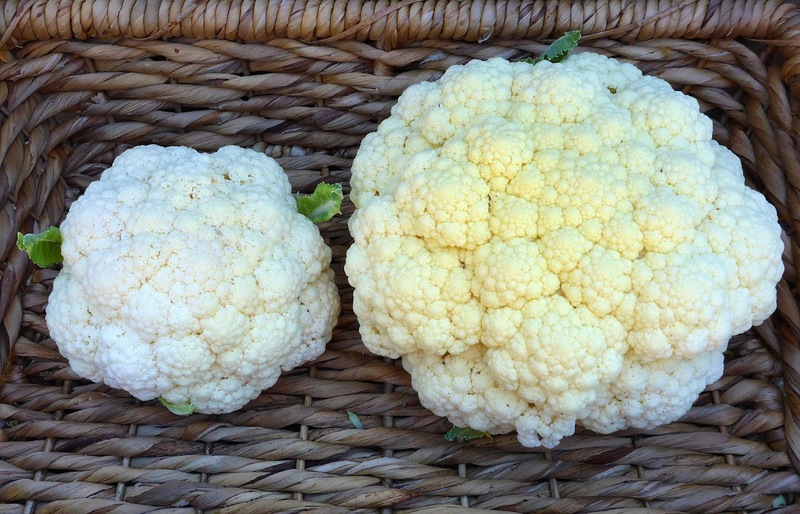 Other harvests this week that I didn't get around to photographing were more capers, another head of Manoa lettuce, some cucumbers, and the first head of Ruby Gem lettuce (which also escaped the scale). 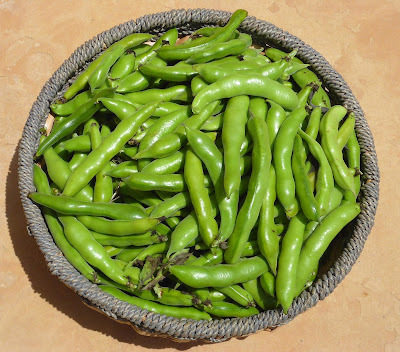 Red Swan beans - 1.3 oz. Roc d'Or beans - 1.6 oz. 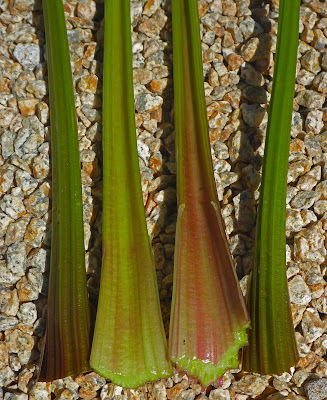 Pink Plume celery - 1.2 lb. 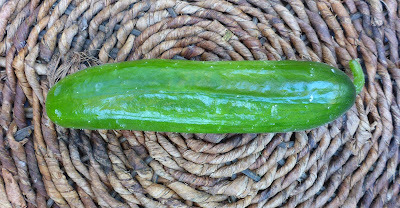 Green Fingers Persian cucumbers - 7.9 oz. 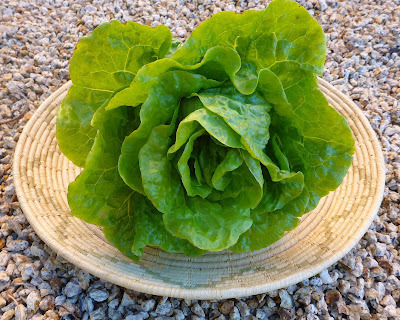 Manoa Crisphead lettuce - 11.5 oz. Di Maggio cippollini onions - 14.1 oz. 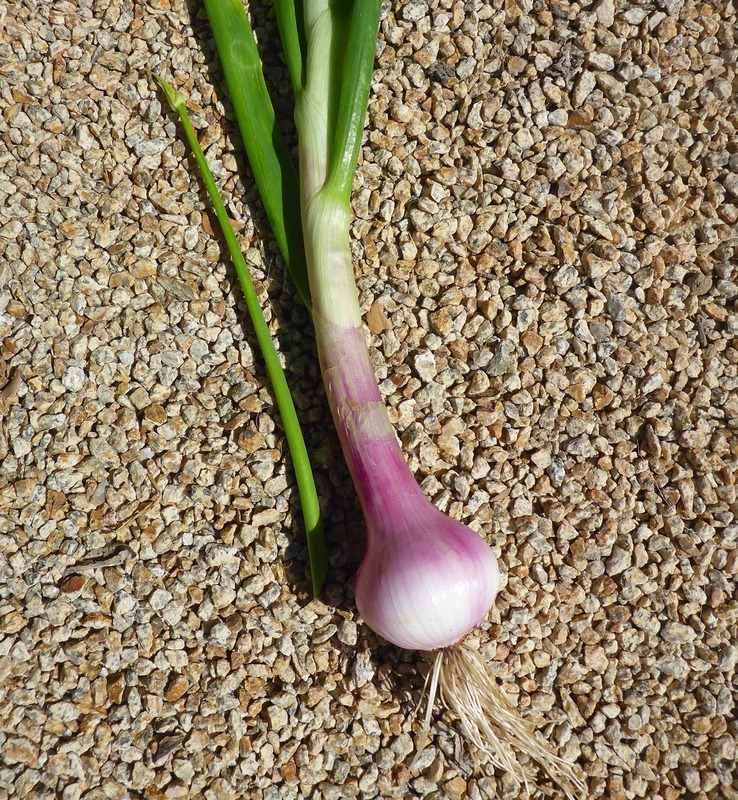 Tropea Rossa Tonda onion - 1.2 lb. Yellow Sweet Spanish Utah onions - 3.5 lb. 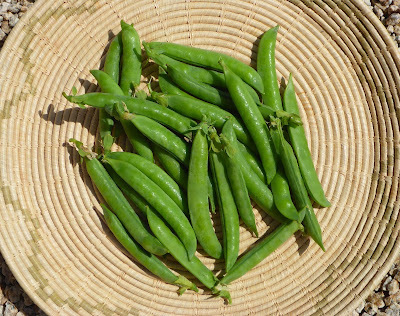 Sabre shelling peas - 2 lb. Romanesco zucchini - 1.8 lb. 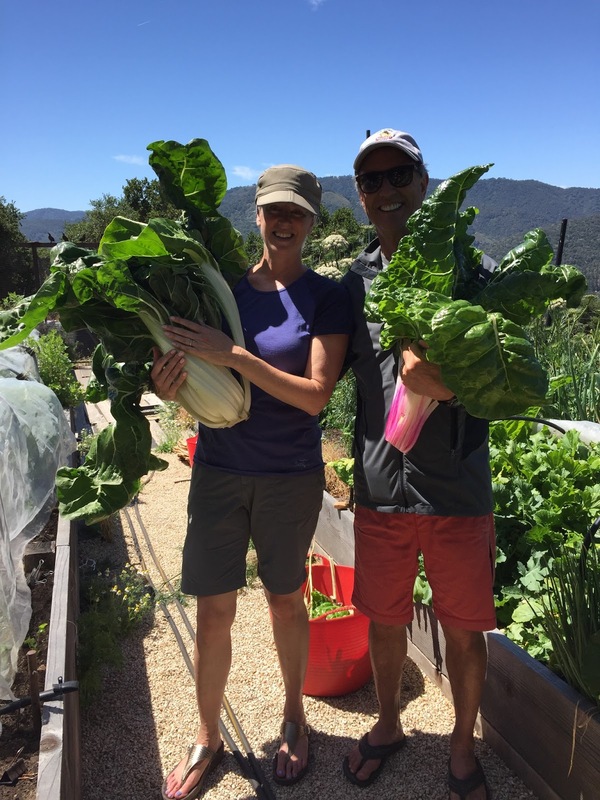 This past week was a pretty generous one for harvests. A number of the spring vegetables are coming to an end and one more summer vegetable is just getting started. All the cauliflower was ready (or past ready) to be harvested this week. One was on the small side, not quite a buttoned head but not close to full sized either. Another was larger but a bit past its prime so it was loose headed. And I caught the third one just a bit past its prime, it could have been a bit more dense, but it's pretty nice. I roasted the larger florets from the big head shown above and served it atop a Delicata squash puree (still some of those keeping from last year) with some crisp bits of bacon. Last night I roasted the rest of that head after tossing the florets with a mix of finely chopped capers and shallots (shallots from last year also). The shelling peas are just about finished and they put out one big almost final harvest, there's just a few pods left on the plants that I've got to get to today before they get to be too large and starchy. 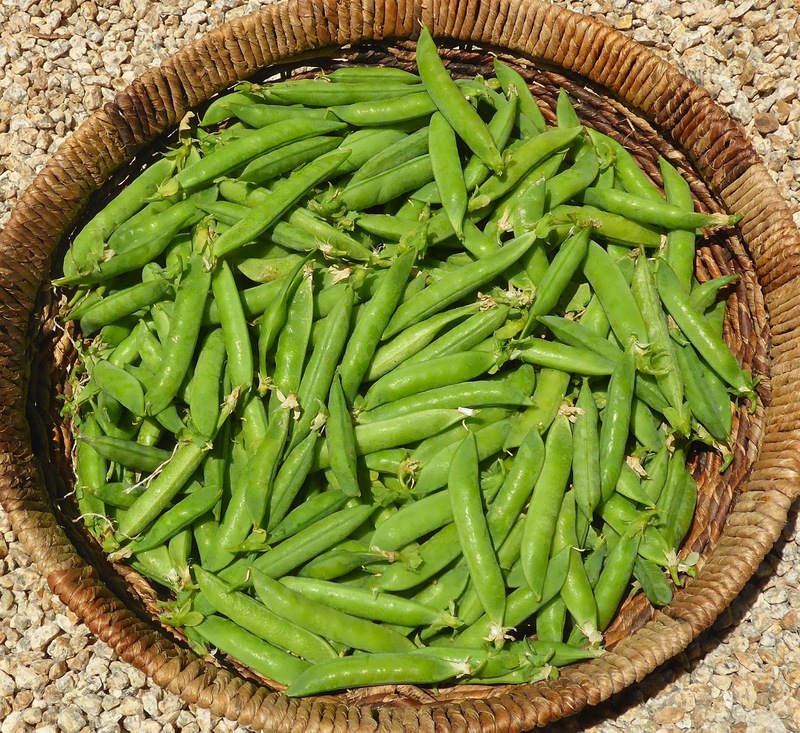 I've been enjoying a lot of the peas straight from the pods in my almost daily lunch salad. 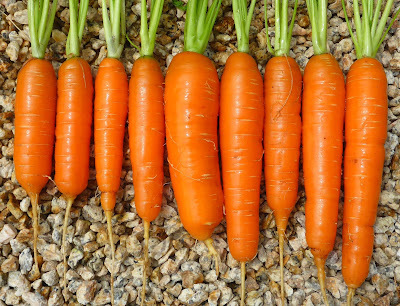 Many of the carrots were in prime condition for pulling. 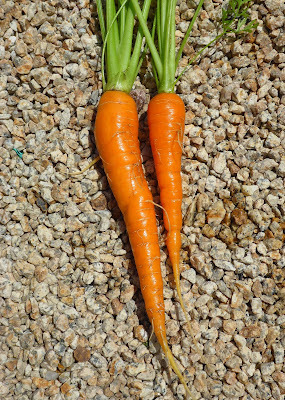 I cleaned out all of the Bolero carrots in 2 separate harvests. Then I pulled the largest of the Nelson carrots. They were a bit shaded by the Boleros so they are sizing up more slowly. 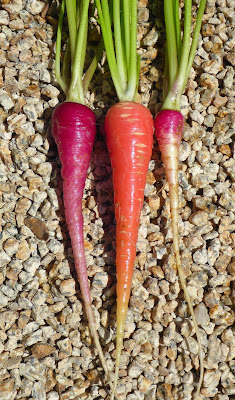 The Rotild carrots were at the back of the carrot patch and were quite shaded by the quick growing and huge topped Pusa Asita Black and Pusa Rudhira Red carrots. They've started to size up now that they're getting more light. The Purple Sun carrots are in the middle of the patch and have also been slow to size up. I think most purple vegetables are slower growing than their green counterparts anyway, so the next time I grow these they will get to be in the sunniest position. 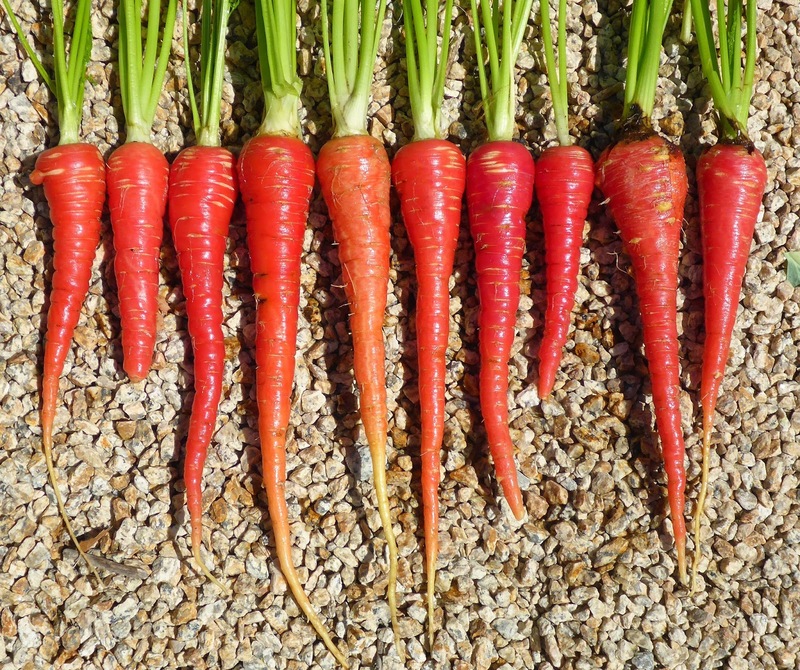 I pulled all of the Pusa Rudhira Red carrots and got a decent amount. 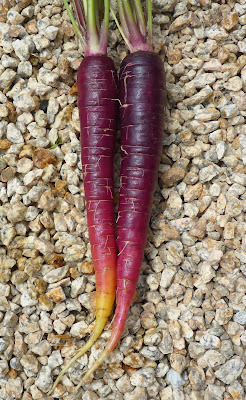 And that's the last of the Pusa Asita Black carrots which turned out not to be Pusa Asita Black. 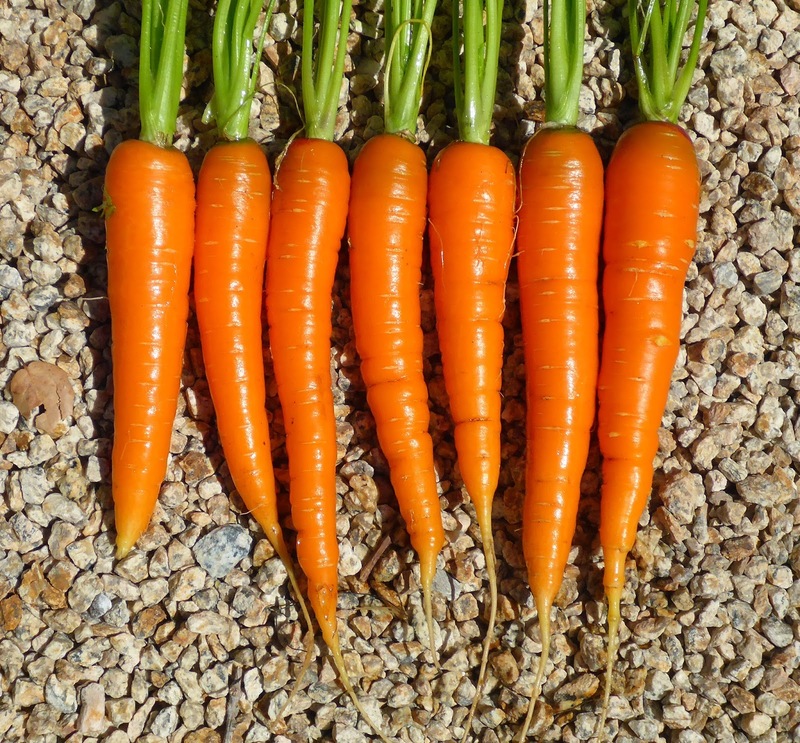 I emailed Baker Creek and sent them a photo of the carrots and they have offered to refund the price of the seeds or send me another variety. 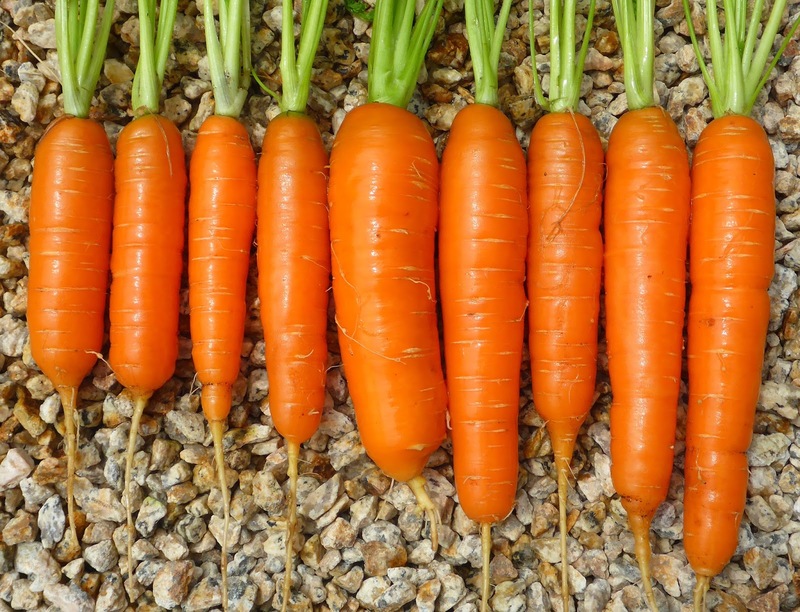 Last night I tried whole roasted carrots for the first time (inspired by the roasted carrots from Glen Ellen Star restaurant that Dave had remembered having about a year ago). The weather was quite warm so instead of heating up the kitchen I fired up the Big Green Egg and roasted the carrots in a cast iron skillet in there instead of the oven. They came out great! I preheated the skillet first and then slicked two each of the Bolero, Nelson, Purple Sun, and Pusa Rudhira Red carrots with some rice bran oil (I use rice bran oil for high heat cooking because it has a high smoke point) and kept the BGE at about 450º F. They all got turned once so they developed some nice dark caramelization on two sides. When the were almost tender I sprinkled them with some brown sugar and a spice blend that was about equal parts dried green coriander seeds, cumin seeds, canela cinnamon, and cocoa nibs, then served them with some chopped cilantro. I used that same spice blend to season a sort of BBQ sauce made from dried Quatro Milpas chiles from my stash that I simmered in water until soft, blended until smooth, then sizzled the spices in some oil, added the chile puree back along with some sugar and pineapple vinegar and salt and simmered it all until thick. Simple and delicious atop a grilled pork rib chop. 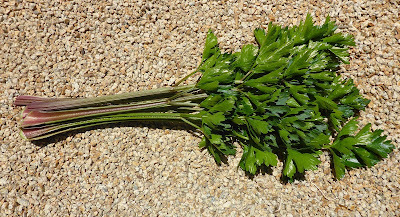 I've always been leery of growing celery in the spring since I've read that they are fussy about temperature fluctuations which is the norm from winter through early summer here, but I really wanted to try the Pink Plume celery so I tried a spring sowing and the plants have performed far beyond my expectations. I've been harvesting a few stalks almost every day and the plants just keep getting bigger and seem to be resisting the urge to bolt. It will be interesting to see how they do as summer progresses. I will be sowing another round soon to get me through this fall and the winter of 2017. I cut the Buck's Horn plantain back hard and kept just some of the youngest and most tender leaves. 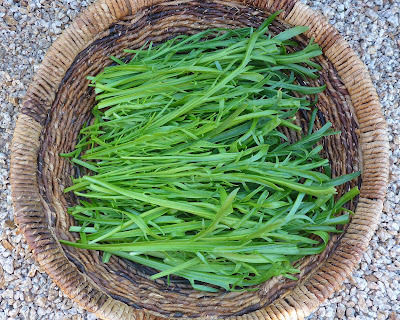 It came back very nicely from the initial harvests for which I cut back the entire plant to within an inch of the soil line. Some of the plants have been producing flowers but it hasn't had a detrimental effect on the flavor and the young flower stalks are tender enough to eat too. 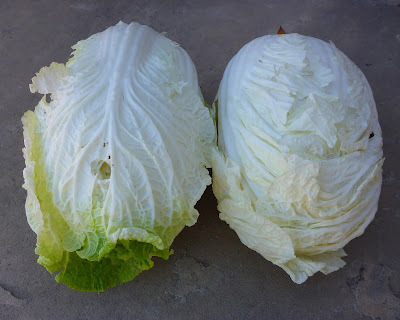 I harvested the first two heads of Manoa crisphead lettuce. This variety is adapted to warm weather having been selected to perform in Hawaii and so far it is doing well in the warm but generally not too hot weather that we've been enjoying lately. Each head was just the perfect size for a main course salad for the two of us. If you have watched my harvests for the past few summers you will be familiar with the hybrid Romanesco zucchini that I've been growing. There's the first one for this year! It didn't get pollinated so it wasn't much larger than that when I harvested it, but the next couple of ones will be more typical of this variety as you'll see next week. 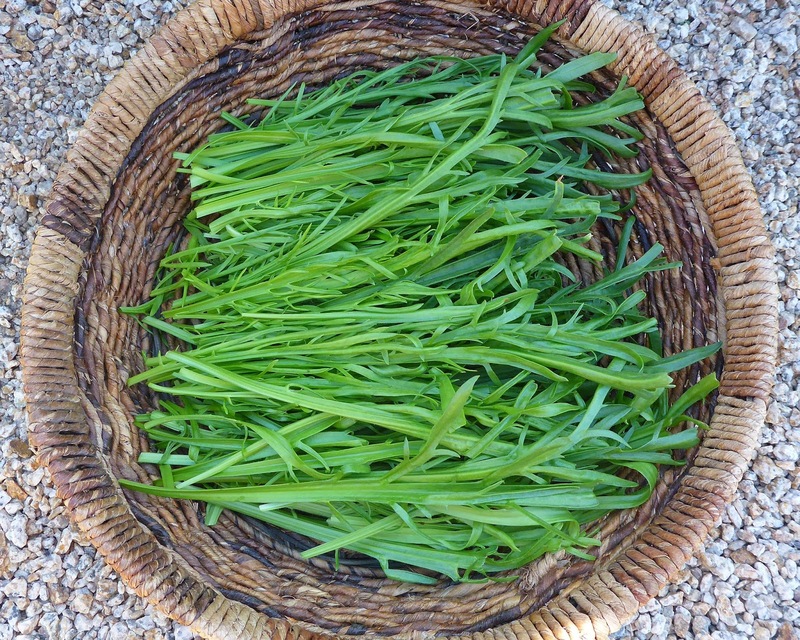 The caper harvests are continuing. I'll have more than enough to get me through the year - 2.2 pounds so far! Other harvests that didn't get photographed included just a few shoots of broccoli and the last of the radicchio which was getting to be a bit brown around the edges but seems to be ok after a bit of trimming. Batavia broccoli - 6.2 oz. 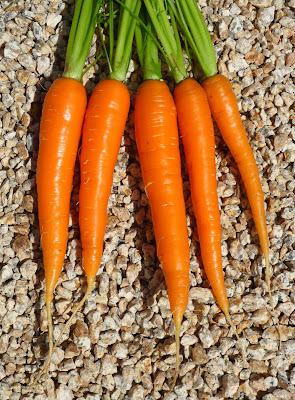 Bolero carrots - 3 lb. 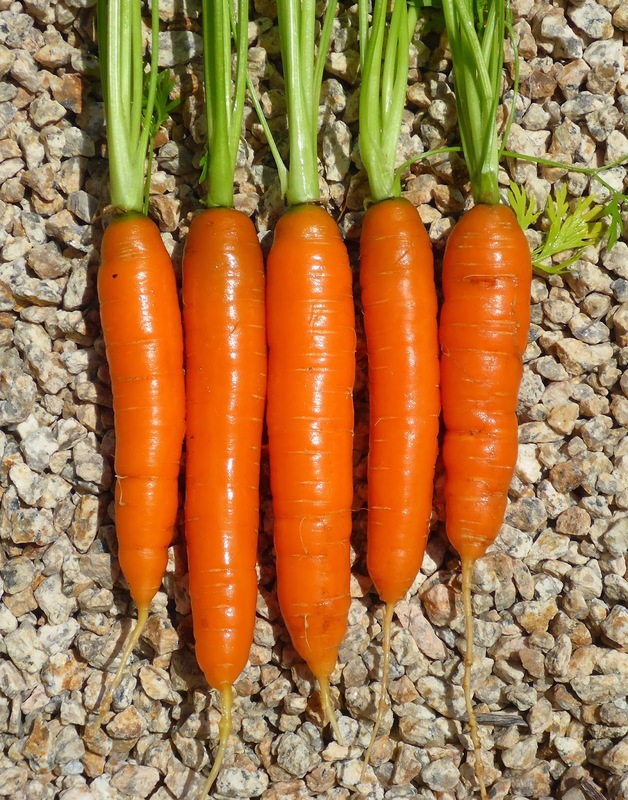 Nelson carrots - 14.9 oz. 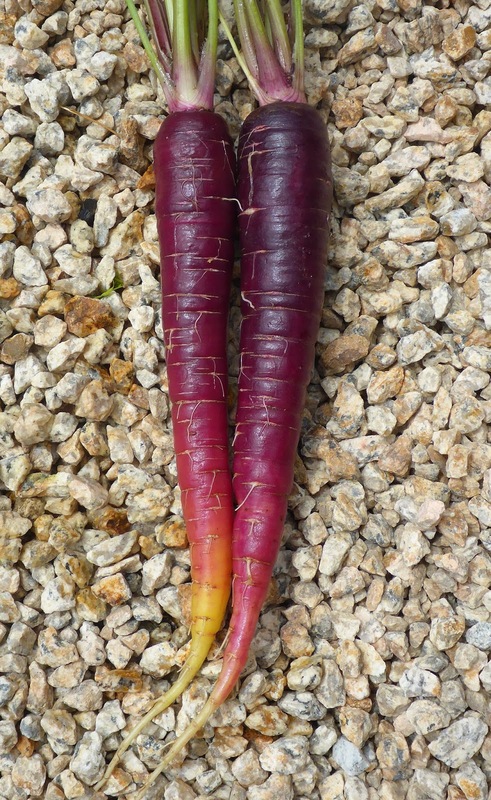 Purple Sun carrots - 4.9 oz. 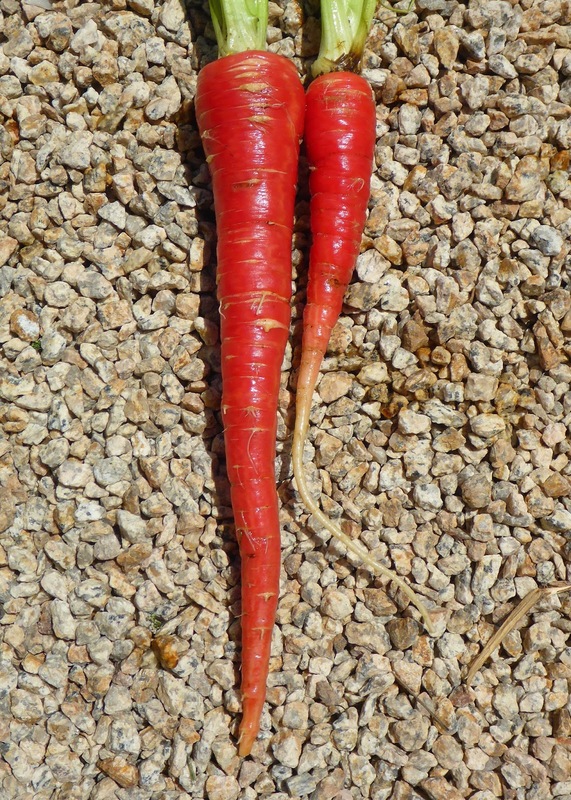 Pusa Rudhira Red carrots - 1.6 lb. 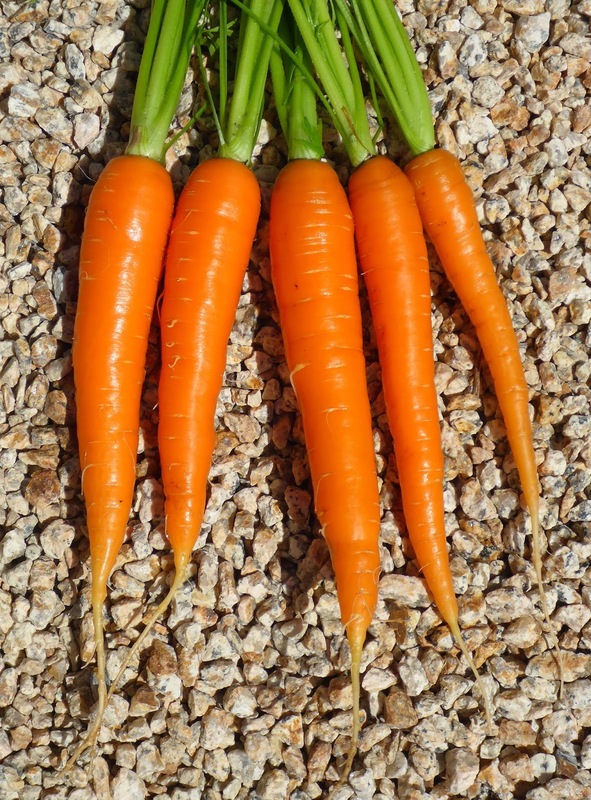 Rotild carrots - .7 oz. 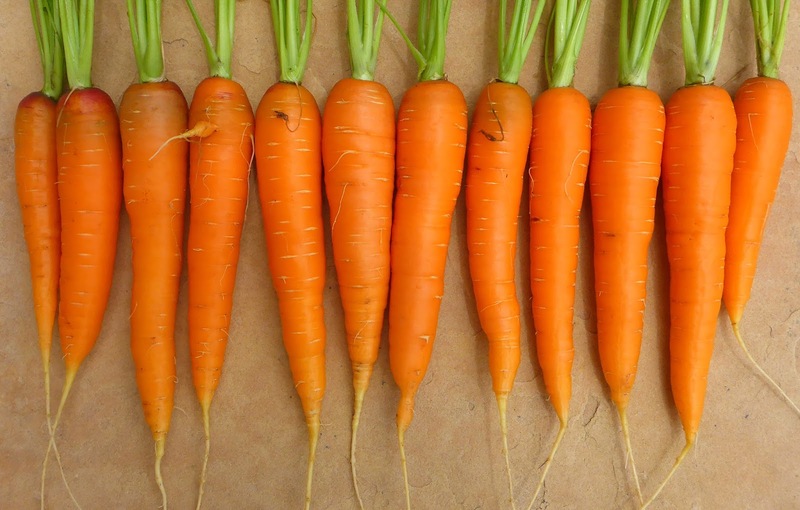 Not Pusa Asita Black carrots - 3.2 oz. 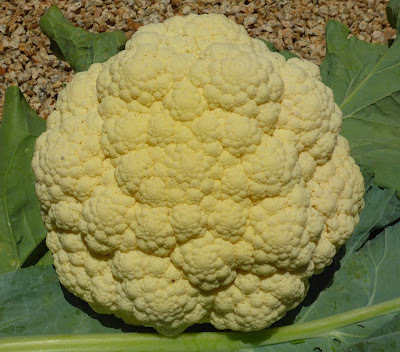 Amazing Taste cauliflower - 4.4 lb. Pink Plume celery - 1 lb. 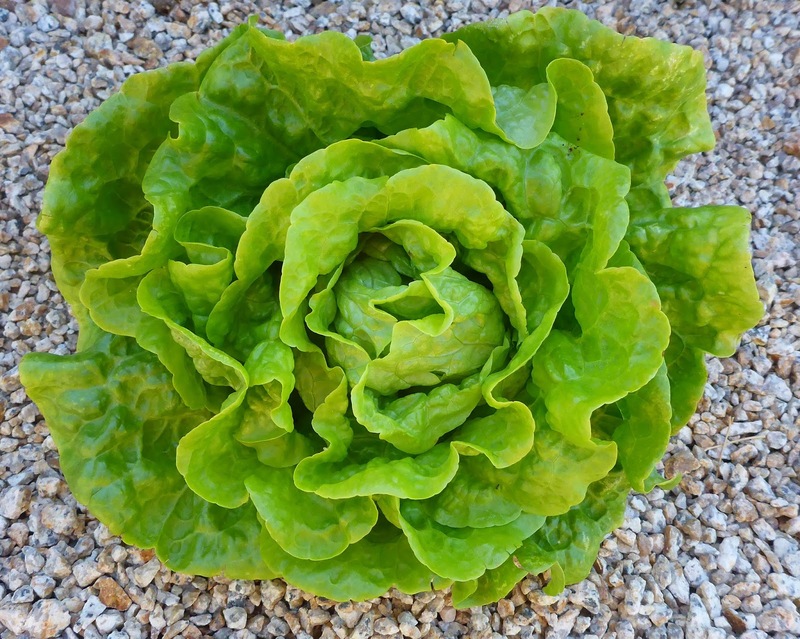 Manoa Crisphead lettuce - 1 lb. 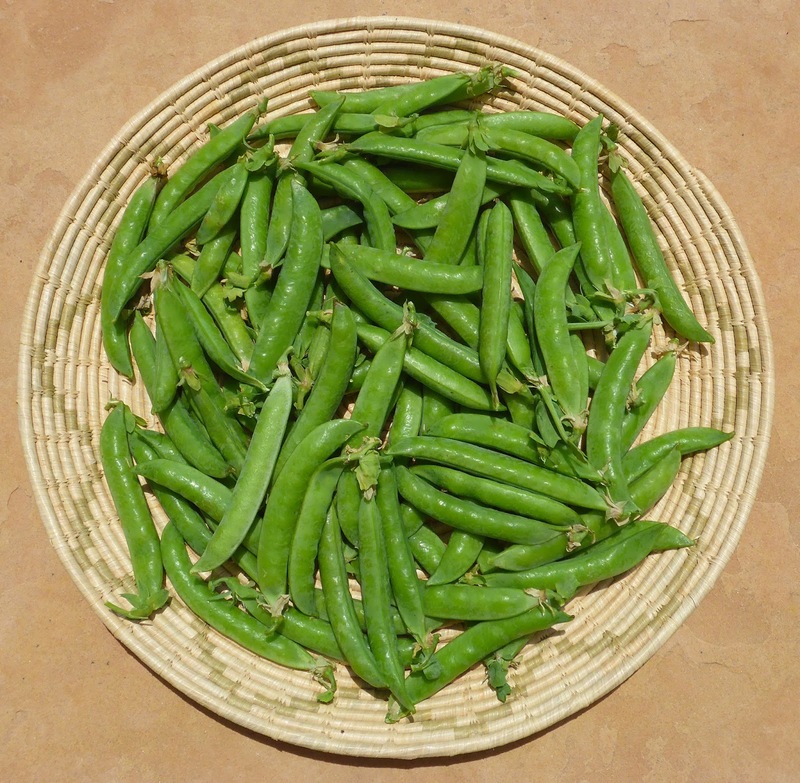 Sabre shelling peas - 3.2 lb. Buck's Horn plantain - 7.7 oz. Palla Rossa radicchio - 2.8 lb. 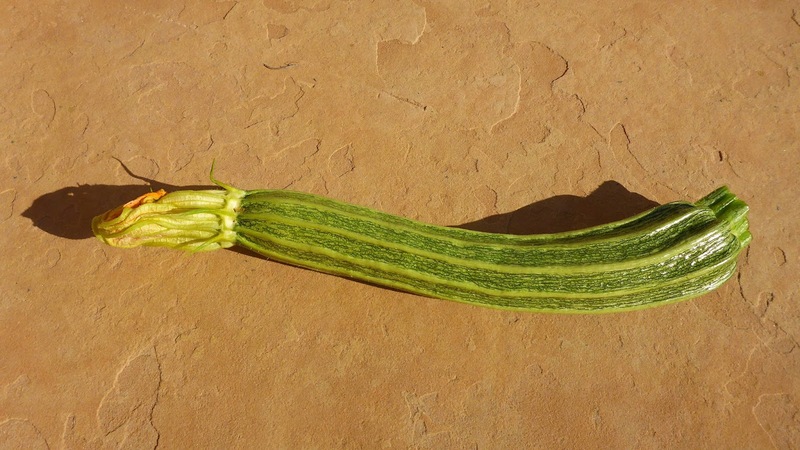 Romanesco zucchini - 3.1 oz. 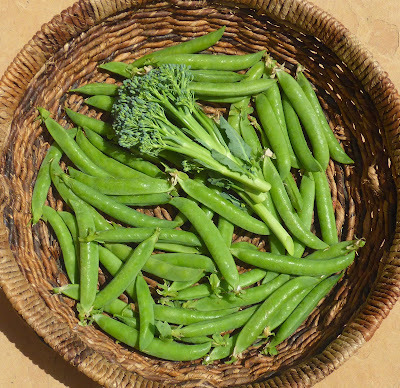 Can it be, is there a "summer" veggie in the harvest basket? Yes! Congratulations, it's a cucumber. 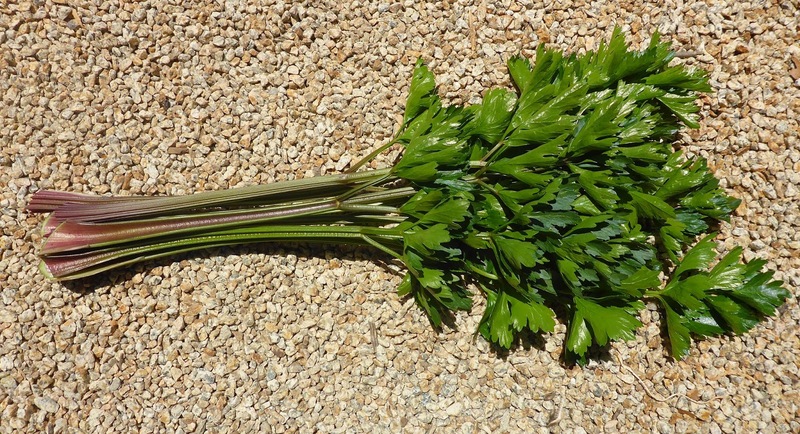 This is an heirloom variety of celery that was introduced in 1894, became very popular, and then virtually disappeared from the commercial seed trade. Seed Savers Exchange offered it this year and I couldn't resist. 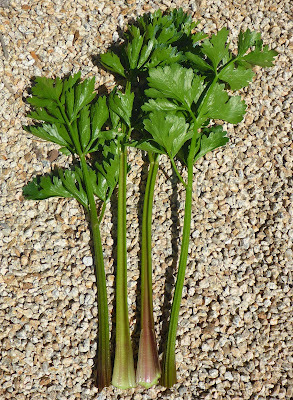 And I was so eager to try it that I attempted a spring sowing of celery for the first time and it seems to have worked. 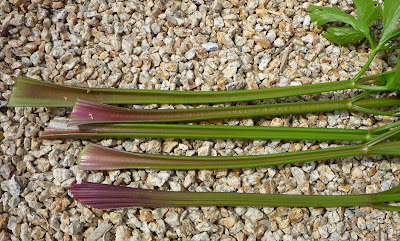 Pink Plume celery is full flavored but sweet and very crunchy. 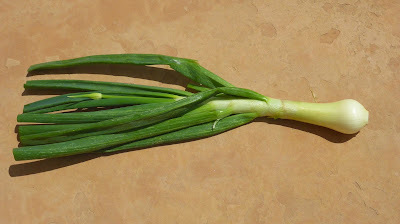 The stalks aren't as juicy as a typical celery but they aren't tough either, although I haven't yet tried just munching on a stalk so I don't know if it's stringy. I've been cutting a few stalks almost every day and slicing them into my salads for lunch and also added some to a white bean and tuna salad that featured some Purgatory beans from my stash in the pantry. I cut the other 2 napa cabbages that were in the garden and it's a good thing I did because I found that something had gotten into the heads and started to munch. And then I found that yet a different pest had found the green cabbage - a blasted RAT! I'm afraid that it may be The Second Year of the Rat - the count has started and I'm up to 7. If you don't know what I'm talking about check the sidebar on my blog and scroll down until you find the tally that I kept in 2011 as Zeke and I caught rat after rat until the tally hit 96 rats - all in less than 6 months. Ugh. Sigh. The broccoli and brokali plants are not producing very many side shoots, just little things like the ones shown above with the peas. I'm happy I've got a few new broccoli plants coming along and didn't count on side shoot production for the summer. My little experimental patch of shelling peas continues to produce. I think it was well worth the space, the plants are producing just enough to enjoy some fresh peas every few days and I don't have to deal with a glut. Lately I've been enjoying them raw in my salads. We also enjoyed a bruschetta topping made with some of the peas and some of the last of the freshly peeled Robin Hood favas with crumbled ricotta salata cheese, shallots (still some from last year! ), basil, and mint. I grilled the bread after lightly smearing it with some Green Garlic Cream. 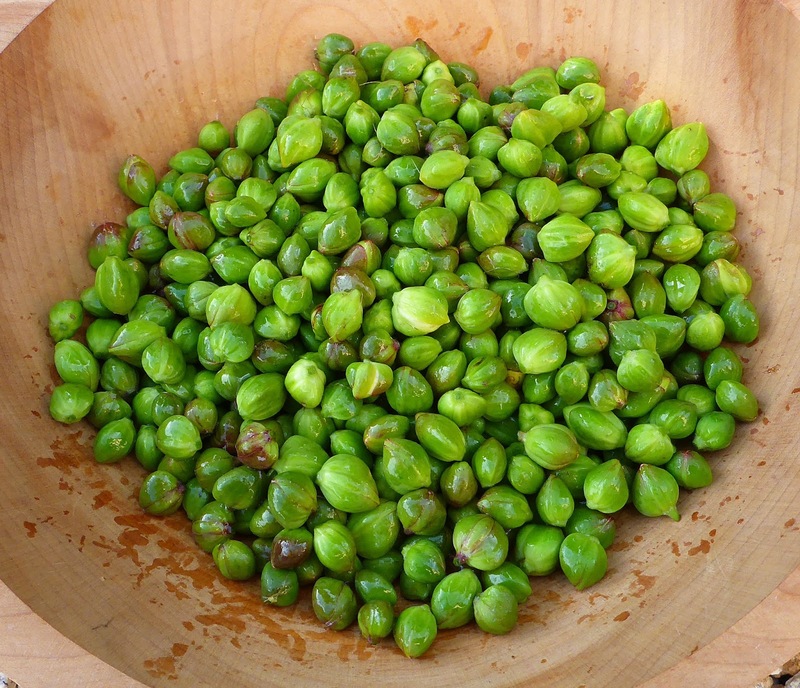 My caper bushes are producing lots of buds this year, about 1/2 pound a week. I keep finding an onion here and there that has decided to bolt. By this time last year a lot of the Candy and Superstar onions that I was growing were sending up flower stalks. It's not as bad this year, just a few onions and not any one particular variety has bolted. I don't know if it's because the new varieties that I'm growing are more suited to my climate or if it's because the temperature swings haven't been as extreme and frequent as they were the last couple of years. But I'm still keeping my fingers crossed, the onions aren't anywhere near mature yet so there's still plenty of time for misbehaving. Pixie cabbage - 1.6 lb. 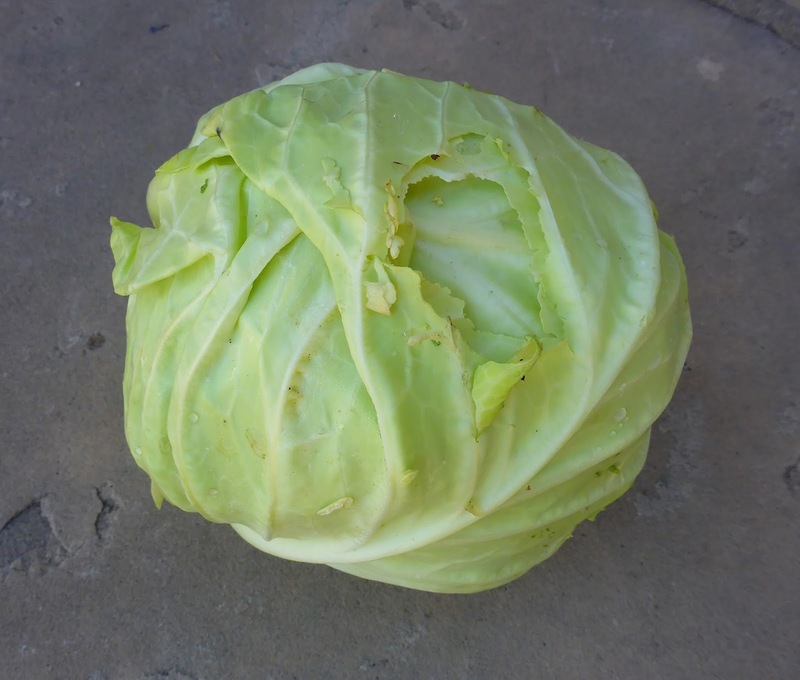 Little Jade napa cabbage - 5.7 lb. 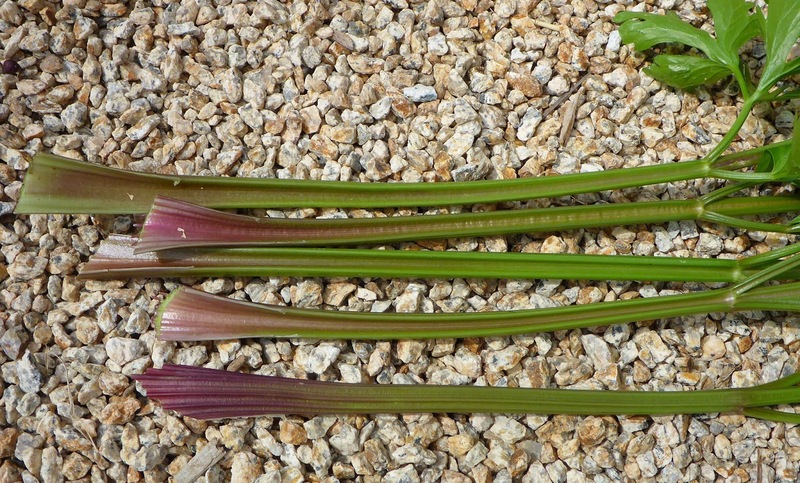 Pink Plume celery - 1.1 lb. Peppermint Stick chard - 4.3 lb. Green Fingers cucumbers - 3 oz. 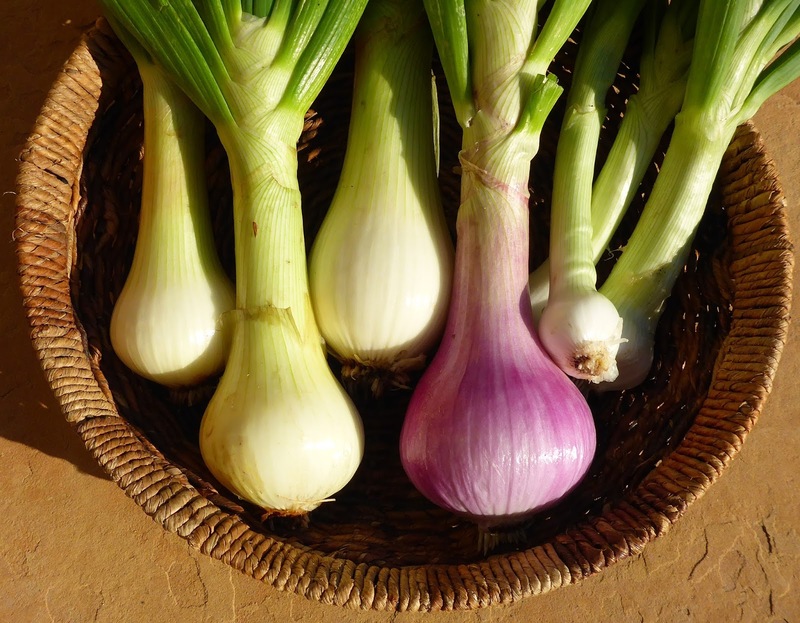 Ramata di Milano onion - 1.1 lb. 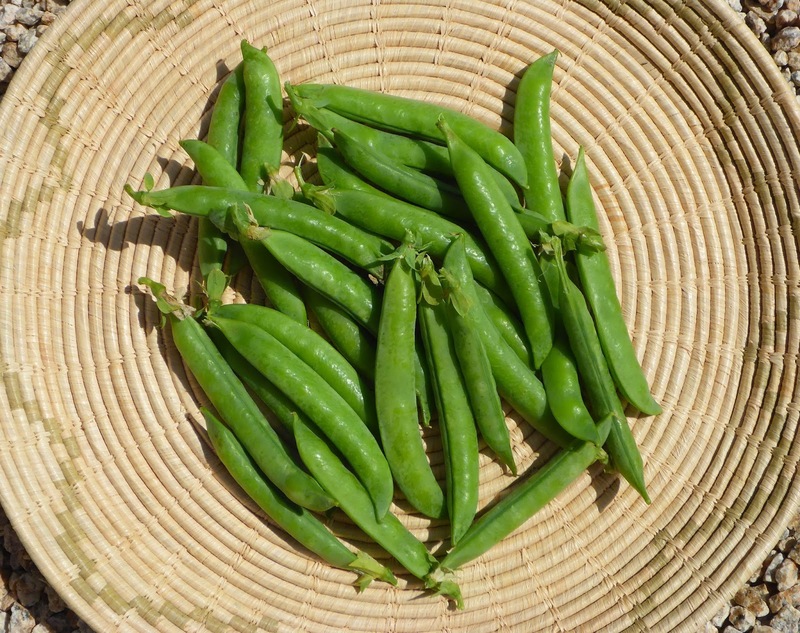 Sabre shelling peas - 2.2 lb. The summer veggies are taking up more space in the garden but aren't producing yet so the harvests are still full of spring veggies. 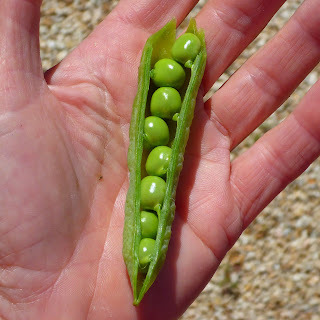 I can't remember the last time I even tried to grow shelling peas. 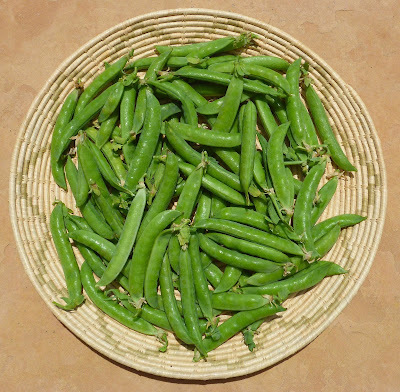 Sugar snap peas have long been my favorite because of the generous volume they produce for a given space and because they require so little effort post harvest. But this year I had the space to try a low growing variety of shelling pea so I put in an experimental patch. These might do even better if I gave them some support but it's worked out ok to just let them sprawl and support each other. They sure are delicious and I'm thinking I'll devote some space to them again next spring. Pixie cabbage is back in the harvest basket again. 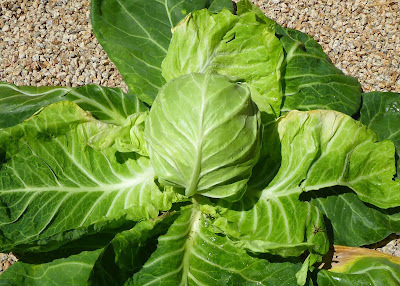 I think this is the 3rd year that I've grown this variety of green cabbage. It is reliable, not too large and not too small, and it's sweet. It's quick to produce also, this head was ready 60 days after I set the tiny seedlings in the garden. I used half of this head in a saute with the first harvest of the Sabre Peas, some Bolero carrots, a spring onion, some Chicken Bacon Rodeo sausage from a local artisan butcher, and some fresh basil. 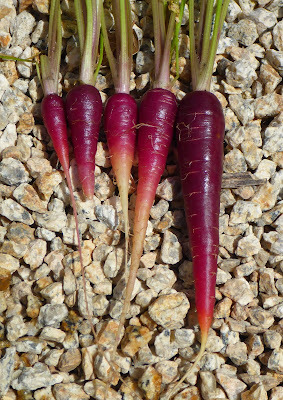 Some of the spring carrots are sizing up nicely now. The Boleros are the carrots that I used in that cabbage saute. 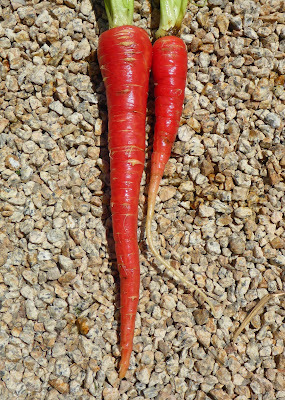 Later in the week I harvested more carrots. The Nelson carrots went into a second saute of peas, carrots, and cabbage in brown butter with basil and onion. 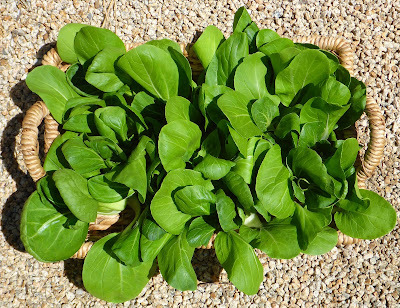 I sowed an experimental patch of pac choi back on April 25. These are supposed to be best sown in the fall since they are prone to bolting in the spring, but they did ok for me, probably because we had our usual Gray May cool foggy weather this year, but they were on the verge of bolting when I got around to harvesting them. 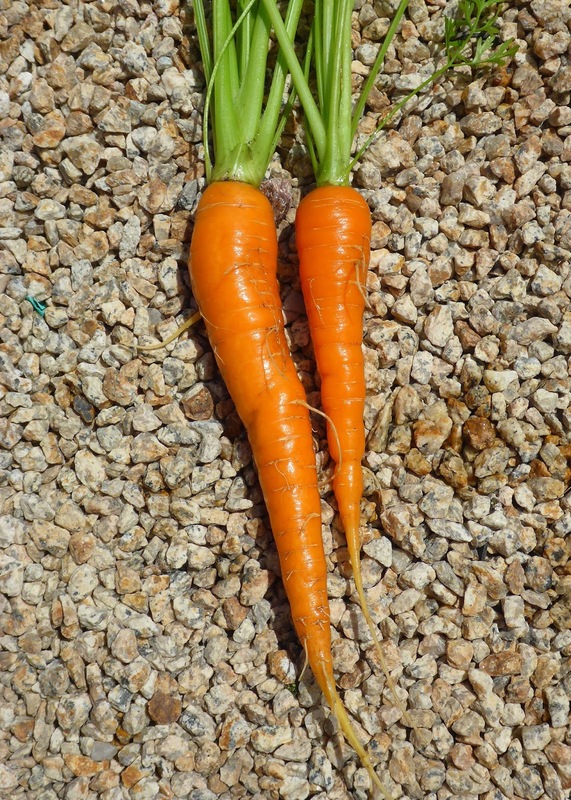 I haven't gotten around to cooking them up yet, so it remains to be seen if I grow them again since they do have to be tasty to return to the garden. 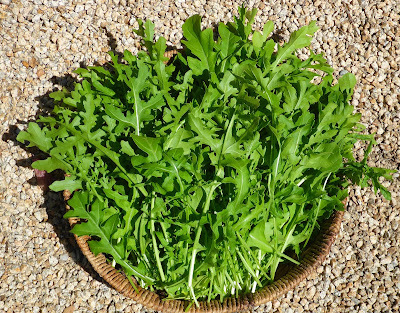 My latest succession of Speedy arugula produced a generous basket of goodness when I finally got around to cutting it. A few of the plants had started to bolt, but that's ok since Speedy doesn't get too spicy when it decides to bloom. 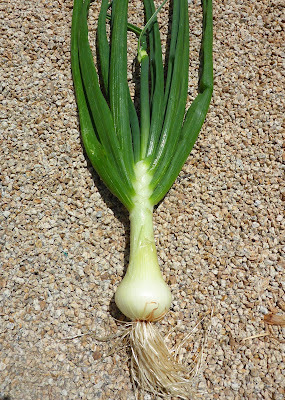 Speaking of blooming, I found the first bolting onions last week. The red one ended up in the first cabbage saute. Half of the second one ended up in the second saute of carrots, peas, and cabbage sans sausage. I shaved another part of the Buck's Horn Plantain patch. It's amazing how the dust sized seeds end up producing really big lush plants. The next time I sow this, and there will definitely be a next time, I have to have a little more faith and sow them more widely spaced. I may try moving a couple of the plants to another part of the garden where I can let them bloom their hearts out since they are supposed to be perennials and the flowers are supposed to be attractive to butterflies and beneficial insects. That's the last 2 harvests of Robin Hood fava beans. Out of curiosity I weighed the beans in the pods that are shown in the first photo, then the shucked beans, then the peeled beans. 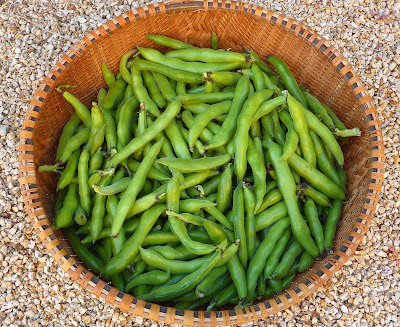 The results were 12.1 pounds pods, 4.74 pounds shucked beans, 2.72 pounds peeled beans. The yield of peeled beans might have been a bit greater but I harvested a number of beans before they fully filled out because I needed to cut down the plants. Yikes, I could not believe how large the Scarlet Ohno Revival Turnips got while I was not looking. They look good in spite of their size and I have in mind turning them into something mashed and buttery. 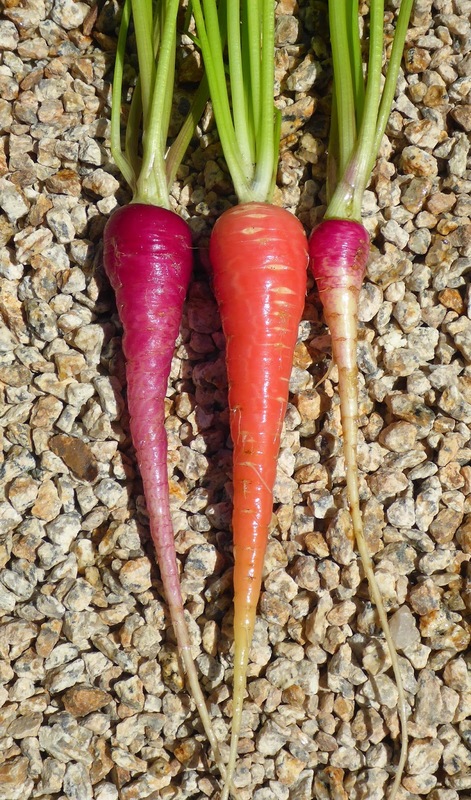 I cleared out the latest bunch of radishes, all of which I've grown and shown before except for the White Beauty. I'll spare you photos of the rest of the radishes. It seems that only 1 of the 8 Palla Rossa Radicchio that I planted didn't turn into a round head but came out tall and a bit on the green side, which really isn't bad for an open pollinated type of radicchio. 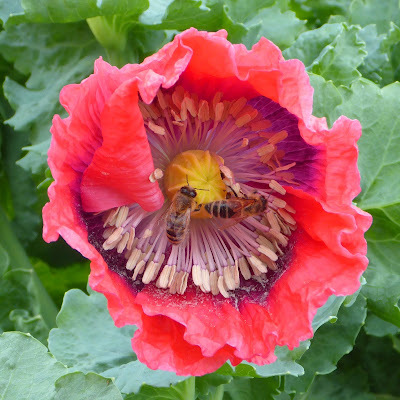 My patience with the volunteer Monticello poppies has been rewarded, they have started to bloom. The beautiful blossoms are huge and hugely attractive to bees. It's great fun to watch the bees swim around in the blossoms gathering up loads of pollen. If I can spare the space and let them mature I should be able to gather the edible seeds which is what this variety is grown for. Not photographed last week were the latest lettuce harvests since they were a bit ragged looking and I've shown them before. And there were a couple of very small shoots of broccoli that escaped the camera as well. 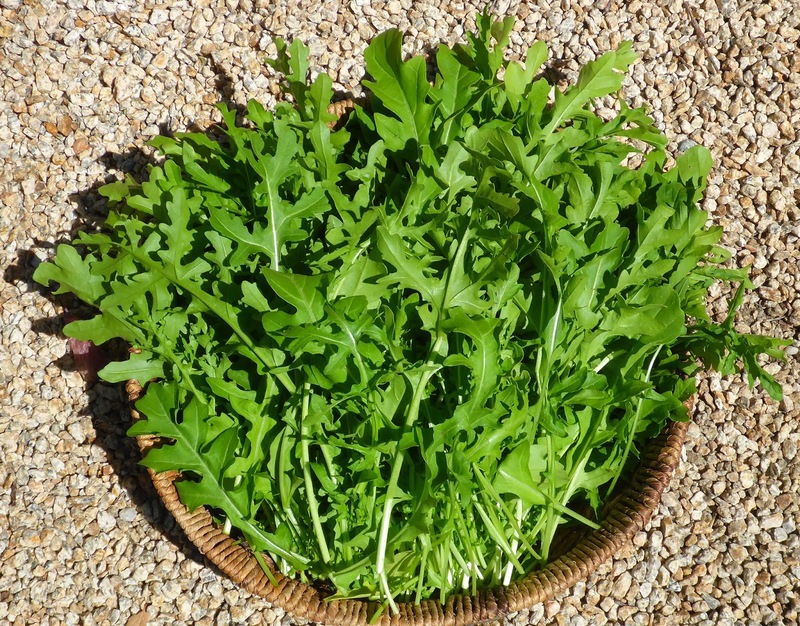 Speedy arugula - 1 lb., 5.1 oz. Batavia broccoli - 2.2 oz. Apollo brokali - 1.2 oz. Pixie cabbage - 2 lb., 4.3 oz. 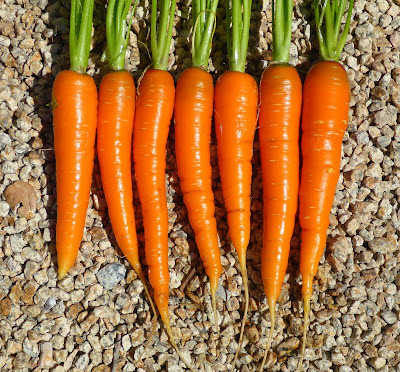 Bolero carrots - 9 oz. Nelson carrots - 7.4 oz. 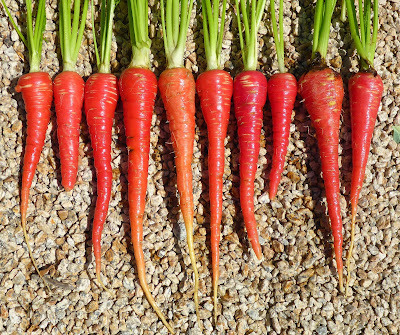 Pusa Rudhira Red carrots - 5.8 oz. 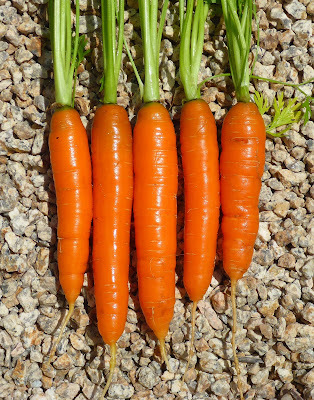 Rotild carrots - 4.5 oz. 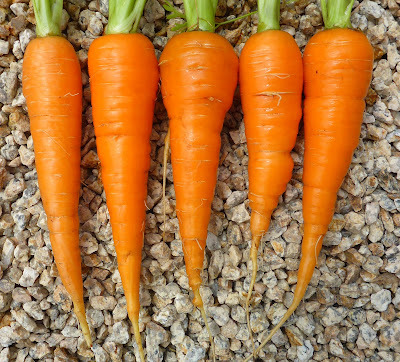 Other carrots not true to type - 1 oz. Robin Hood fava beans - 19 lb., 12 oz. 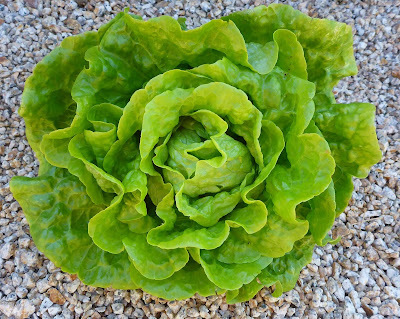 Joker Crisphead lettuce - 10.4 oz. 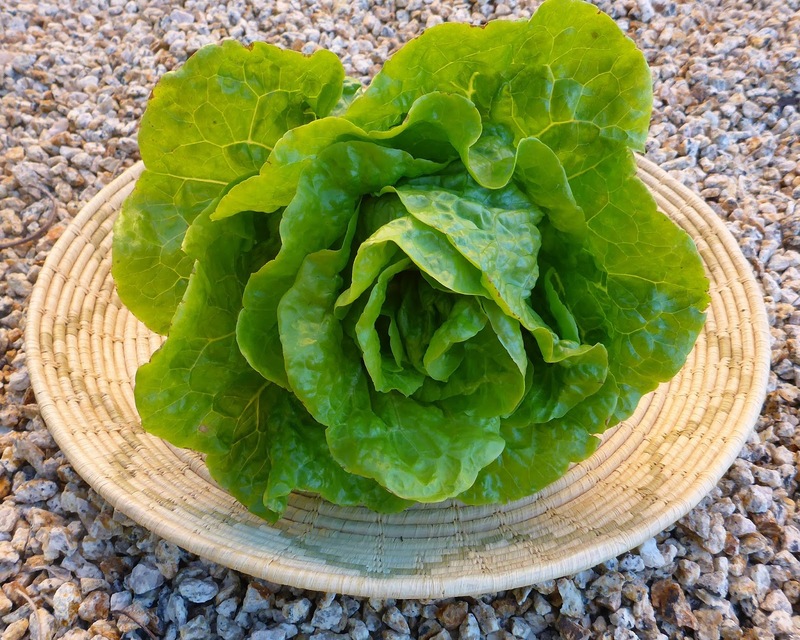 Red Butter Romaine lettuce - 10.1 oz. Tropea Rossa Tonda onion - 13.7 oz. 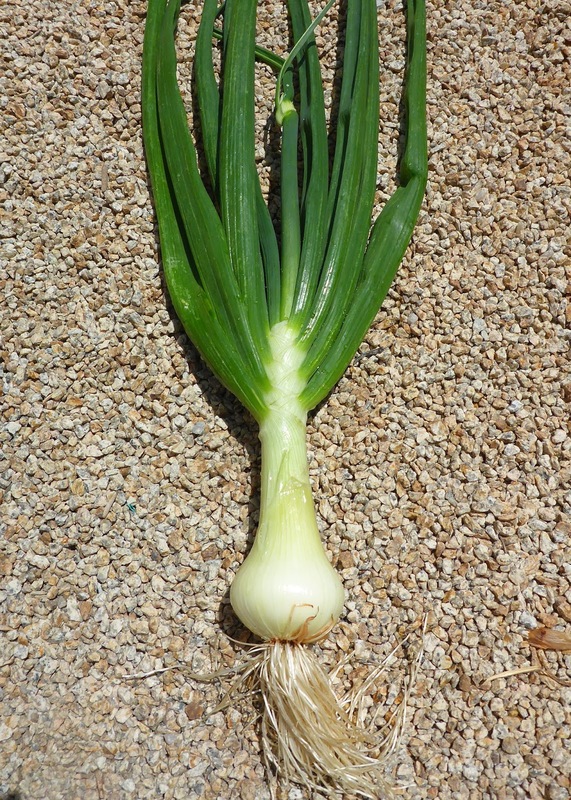 Yellow Spanish Utah onion - 1 lb., 8.9 oz. Shanghai Baby pac choi - 1 lb., 12.5 oz. Sabre shelling peas - 1 lb., 11.5 oz. Buck's Horn plantain - 1 lb., 14.8 oz. Helios radishes - 11.6 oz. Malaga radishes - 7 oz. Petit Dejeuner radishes - 10.6 oz. 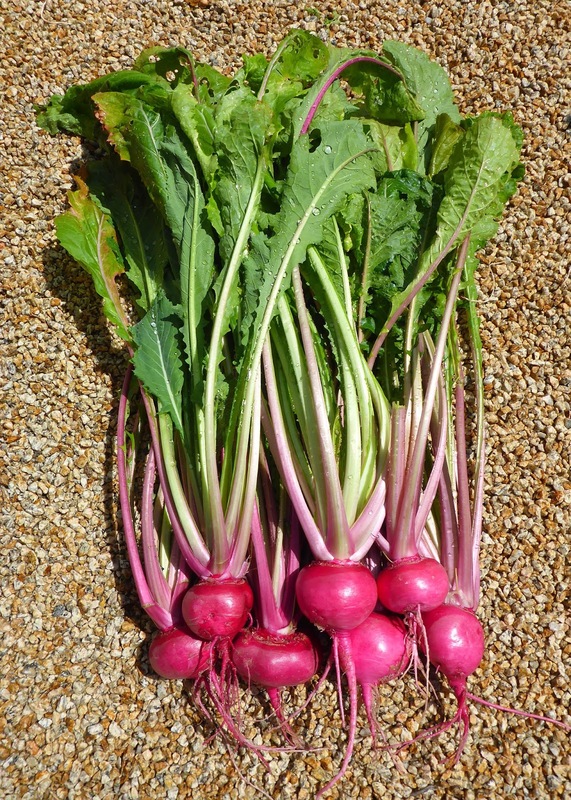 Pink Punch radishes - 6.9 oz. 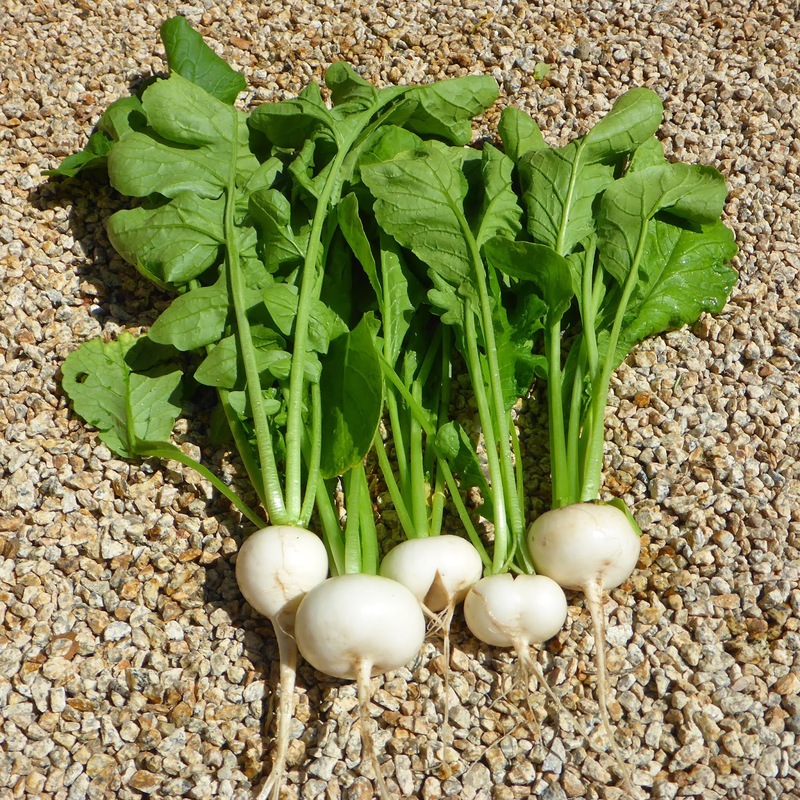 White Beauty radishes - 12.5 oz. 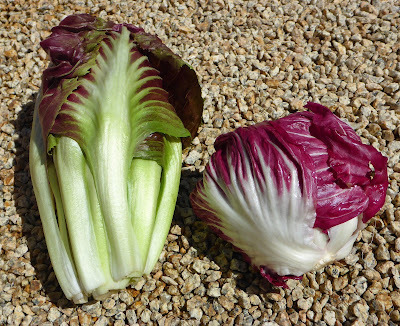 Palla Rossa radicchio - 13.7 oz. 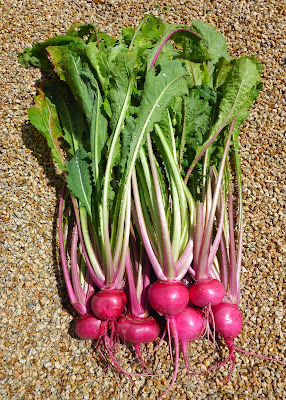 Round Red turnips - 6.2 oz. Scarlet Ohno Revival turnips - 2 lb., 13.9 oz.